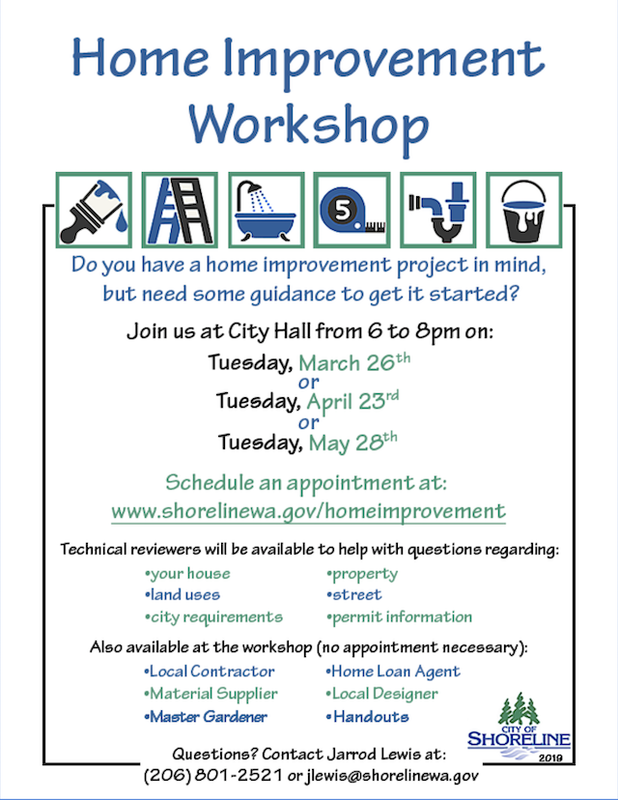 The City of Shoreline's very popular home improvement workshops have been scheduled for 2019. Sessions will be held on March 26, April 23, and May 28. At these sessions, City Planning staff will give 15 minute individual sessions to review your plans and ideas for home improvement and answer your questions about your project. In addition, there will be a large vendor fair, with businesses related to home remodels. This year sewer representatives will be present for those who are considering replacing their sewer lines. Residents will need to make appointments for the individual sessions but anyone can come to the vendor fair, which will be open between 6 - 8pm. The event is held at City Hall, 17500 Midvale Ave N, 98133. Free parking in the City garage. You can sign up now for any of the sessions.